Q: What are the differences between the US Version and the German Version? 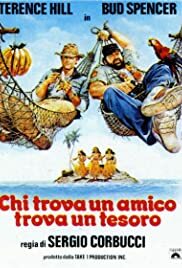 As a Bud Spencer/Terence Hill fan, I always loved to watch these two guys giving a punch for all the bad guys (whose were almost all the same in each movie :)), but this film was the best of their works. All the jokes, the funny characters and scenes (especially the closing sentence) are classic! The acting is not so strong but in these films it's not really important at all. Spencer and Hill bring their own style, playing each other and tricking, gaging all the time. My only complain is the poor English dub. The Hungarian version is much more witty. Too bad for that. But don't worry, it's not a big loss. If You like to laugh, but don't care about realism and just want to chill out with a can of beer, this is the movie you must see!